Mary Queen of Scots' death mask, her sapphire ring and a casket worth £1.5m have gone on show in Edinburgh. The historic artefacts form the centrepiece of a free exhibition giving fans a rare chance to glimpse into Mary's tragic life. The items come from the stately home of Lennoxlove in East Lothian. Instead of being put into storage, some of the artefacts have been put on display at Edinburgh-based auctioneers Lyon and Turnbull. The home was once run by the Duke of Hamilton, who opened the exhibition on Tuesday. He said: "As Lennoxlove will be closed for two years, and while extensive conservation and refurbishment takes place, it was an opportunity to create this unique exhibition. "It will allow many visitors to Edinburgh the opportunity to enjoy pictures from one of Scotland's finest collection of family portraits, as well as examples of furniture and porcelain associated with my family which has enjoyed a unique place in Scottish history." 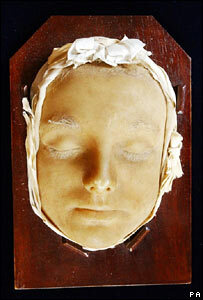 The wax mask was placed over Mary's face after her death in order to preserve her features forever. Eyelashes, eyebrows, hair and paint were added later to give the mask a lifelike appearance. It has been in the Hamilton family's possession for more than 250 years. Their dynasty was related to Mary centuries ago. The casket has major historic significance as it was reputed to have contained the "casket letters" said to have been written by Mary accusing her husband Lord Darnley of being a traitor. The sapphire ring was left by Mary to the first Marquis of Hamilton. Other notable items in the exhibition include a portrait of Frances Stewart, Duchess of Lennox, who gave her name to the stately home. The exhibition will also contain examples of Lennoxlove's collection of armorial china, from early 18th Century Chinese pieces, to the late 19th Century English artefacts. The Treasures of Lennoxlove exhibition in Broughton Place opens from 1100 BST to 1700 BST and runs until 18 August.